My friend, Helen, brought this salad to a “ladies” potluck. It was beautifully presented in the watermelon shell fashioned to look like a basket complete with a handle. She used a melon baller for perfect little watermelon balls. If you are feeling creative and you own a melon baller take this to your next summer potluck. It will steal the show for its looks and is so light and refreshing on those hot days in summer. It is great with anything you barbeque. Zest and juice the lime into a salad bowl and add the diced onion to marinade. 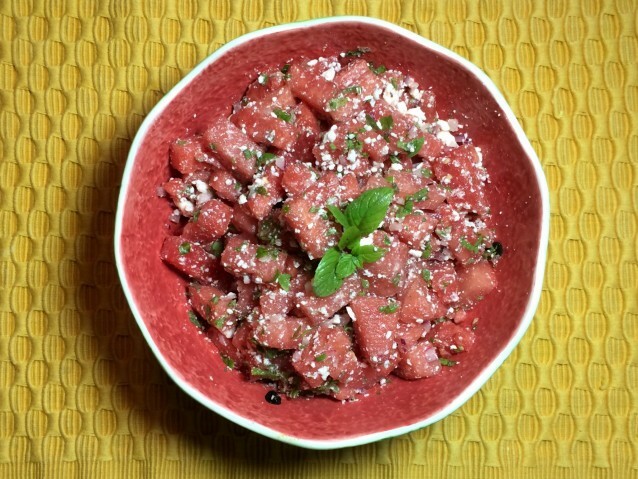 Cut the watermelon into 1″ cubes or use a melon baller for perfect little balls. Place in a colander and let drain as you cut. Add to salad bowl with the lime and onion. Crumble the feta cheese over the top. Sprinkle with the mint.